2. Review comprehension questions from yesterday's work that you completed with the substitute. 3. HOMEWORK: You will have a 10-multiple choice question quiz tomorrow. This quiz will cover these four words and their definitions - speed, velocity, displacement, and acceleration. In addition to these vocabulary words, you should MEMORIZE the speed formula and MEMORIZE the acceleration formula. I will have math questions on this quiz. 1. I will not be here today. Please follow the directions give to you by the substitute. 2. Read pages 328 - 332. Now, you know I do not have enough books for each of you. Many of you will have to read online. Chapter 11 is below the homework for today! It is exactly the same as what is in the green book. Do not fight over the green hardback books. I do NOT want to read any such message from the substitute that you couldn't get along. 3. While reading, you MUST define and state the page number where the definition is found of these three words: Acceleration, qualitative data, quantitative data. 4. After reading, you MUST answer questions 1, 2, 3, 4, and 5 on page 332. Answer these questions on a sheet of lined paper. Yes, I'm taking it for a grade! 3. HOMEWORK: Finish calculating acceleration speed for the student you were assigned. 3. Gather data on three students. This data will be used tomorrow to calculate speed at each interval. I would like to calculate acceleration at each distance, too. We will do all calculations on Tuesday. 1. Build Accelerometer. You will use this device on Monday. 1. We need to go over the assignment from Monday since we did not do that yet. As we review each answer, please make necessary changes to your paper. 2. Practice Problems: Solving for Time using the speed formula. 1. Calculate speed using data collected from outside running activity. 3. HOMEWORK: Complete only the speed problems. 1. We will go over your reading and vocabulary tomorrow. I really want to collect speed data today. 3. HOMEWORK: NONE tonight, unless you didn't finish the reading selection and the five questions from yesterday. 1. Read pages 8M - 13M . 3. Questions: Questions 1, 2, 3, 4, 5 at the end of this section. NOTE: Although the reading assignment is the same in both the green book and the online book, Taylor pointed out the that the end of chapter questions are different. If you started with the green book, you will need to finish using the green book which is down below the homework for today. If you started this assignment using the online chapter link, you need to finish the assignment using the link. I find that the questions are similar in difficulty level. 3. Review Guide Part 2. Complete ALL four practice quizzes below. When you finish the quiz, click on submit. Scroll down that screen until you find the portion of the screen that allows you to EMAIL me your score. Please use my Google email (lori.young@evsck12.com) when you email me your results. Yes, you MUST do all FOUR quizzes. 2. Begin work on the review guide. You will see a picture of the Promethean Board below to help with those questions. I will give you 10-minutes tomorrow to finish this part of the review guide. 3. HOMEWORK #1: Review Guide. 4. HOMEWORK #2: Virtual Snow Day Make-up Lesson #4 is due Monday, May 4 no later than 7:30 a.m.
2. Work on Wiley Rock and Mineral Activity. I will give you 10-minutes tomorrow at the start of class to finish this assignment. 4. HOMEWORK #2: Complete virtual lesson #4. This lesson is due on or before Monday, May 4 at 7:30 a.m.
1. Collect the Rock Cycle Flow Chart. This flow chart was to have been completed over the weekend. 2. Igneous Rock Lab. 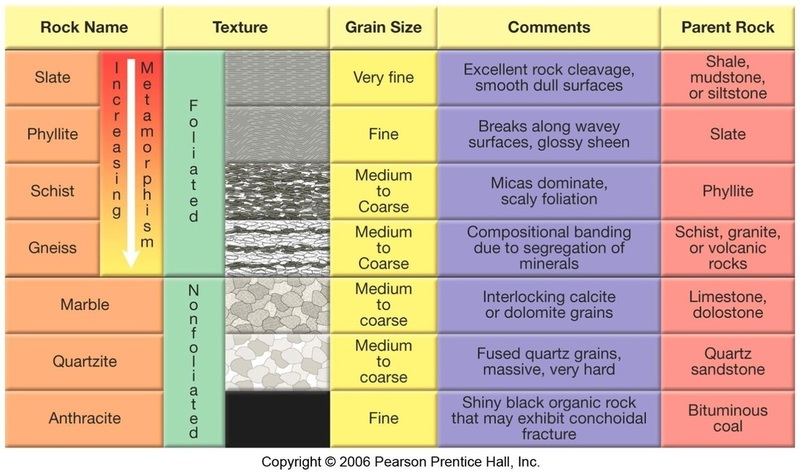 You will identify eight igneous rock samples using the chart provided in class. 3. HOMEWORK: Complete virtual lesson #4. This lesson is due on or before Monday, May 4 at 7:30 a.m. This is the final virtual snow day make-up lesson you will need to complete. I want you to read the article and answer the questions that follow on "What's best for the land?" You will need to complete this assignment using My Big Campus. The assignment is under the schoolwork tab. 2. Watch video clip on IGNEOUS Rocks. You will complete the igneous rock section on your flow chart with me. 3. Watch the sedimentary rock video clip and the metamorphic rock video clip on your own. While watching these two video clips complete the rest of your flow chart. 4. Homework #1: The rock flow chart is due on MONDAY at the start of class. 5. Homework #2: Make sure you complete the third virtual snow day lesson by Monday, April 27 before 7:30 a.m.
B. Define the following words: Solidification, lava, magma, instrusive, extrusive, polutonic, felsic, intermediate, mafic, and vesicular. If the word is in red, you MUST use the definition from the textbook - the exact page you find the definition! No glossary! C. Answer these questions about today's reading. You should write your answers in your science journal. I'm considering your vocabulary as question 1. 3. What is the difference between lava and magma? Explain BOTH in detail. 4. Pumice is a type of igneous rock has visible holes in it. Explain what occurred during the formation of this rock to cause these holes? 5. The formation of igneous rocks can be classified either intrusive or extrusive. Which one of these classifications leads to the formation of large crystals? Explain how these large crystals are formed. 6. Compare and contrast the differences between basaltic, granitic, and andesitic magma and give at least two characteristics for each. 7. Granite, pumice, and scoria are igneous rocks. Why doesn’t granite have air holes like the other two? 2. HOMEWORK: Keep reviewing the vocabulary from Thursday, April 16. I will give you a quiz on this vocabulary. I just haven't decided when I would like to give it. It would be fun to give a pop quiz during this week. 3. HOMEWORK #2: Complete the third snow day virtual make-up assignment. The third lesson is due by Monday, April 27 no later than 7:30 a.m.
1. Remember! Your third snow day virtual make-up assignment is due this Monday, April 27 no later than 7:30 a.m.
3. HOMEWORK: Keep reviewing the vocabulary from Thursday, April 16. I will give you a quiz on this vocabulary. I just haven't decided when I would like to give it. It would be fun to give a pop quiz during this week. 4. HOMEWORK #2: Complete the third snow day virtual make-up assignment. The third lesson is due by Monday, April 27 no later than 7:30 a.m.
1. Review Vocabulary! Use the Quizlet link from Friday to help you review. 2. Rewatch BrainPop video clip and go over the ten-questions. 3. HOMEWORK: Complete the half sheet given to you in class. You will use the PowerPoint provided on karsts and will watch a 9-minute video clip titled “Karsts in the Ozarks: Part 2”. After perusing the PowerPoint and watching the video, you will answer 10-questions over this material. These 10-questions can be found on My Big Campus - Schoolwork. You will need to answer the 10-questions using My Big Campus. This assignment is due on Monday, April 27 no later than 7:30 a.m.
1. Discuss the vocabulary from Thursday. Here is a Quizlet vocabulary link so you can review the definitions. 4. HOMEWORK: Watch the BrainPop video. Follow the directions that found on the BrainPop video link. You can print out the worksheet on your HOME printer before answering the questions, you could write your answers on a sheet of paper, or you can copy the Google doc and mark your answers right on the worksheet. So, here should be NO excuse on why you didn't finish this assignment! 4. HOMEWORK: Just finish the vocabulary. Tomorrow, I will have you do some reading. I haven't decided if you are going to do a worksheet over the reading. I would prefer to have a class discussion. 2. STOP - - REGROUP -- SLOW IT DOWN. We MUST slow down just a bit. Right now, I feel that all you are doing is memorizing information and spitting it back out at me. Memorization does have its place in learning, but not on the rock cycle. So, tonight I want you to complete the assignment that was handed out in class. Make sure you have it TOTALLY completed for tomorrow's class. 3. HOMEWORK: Virtual Snow Day Lesson 2. This lesson is due on or before Monday, April 20 at 7:30 a.m.
2. ACTIVITY: How are Sedimentary Rocks Formed? You will need to set up this activity today. 1. Collect first virtual snow day lesson. 2. Take post-test on Acuity. This weeks lesson is found on My Big Campus. You need to log in to My Big Campus and go to schoolwork. You will see an assignment titled "Looking for Lucy." You need to read the article, complete the 10-questions, and submit it. Don't forget, you must click on the SUBMIT button to turn in this assignment. ALSO, this assignment is due on or before Monday, April 20 at 7:30 A.M.
1. Review sedimentary rock data table. 2. Complete quiz and reading selection. 3. HOMEWORK: Virtual Snow Make-up Lesson Week 1. It is due on Monday. 1. Finish collecting sedimentary rock data. 2. Go over answers to data table. 3. HOMEWORK: Review data table. You will take a quiz over this data tomorrow. 1. Comprehension Questions from yesterday's reading assignment. We will go over these answers tomorrow during class. 2. Large group instruction today. Mr. Scholz's group will join us today for our lesson over sedimentary rocks. Mrs. Simonsen is our guest instructor. 3. HOMEWORK: NONE . . . unless you need to finish the Virtual Snow Makeup lesson. 1. Read pages 532 - 535, 545 - 551 in Chapter 18 of the green book. You know I only have 9 green books, so I've attached a pdf file of chapter 18 below. 2. Comprehension worksheet. You can either complete this worksheet in your journal or use the google doc. 3. HOMEWORK: Finish the comprehension worksheet. You will use this in tomorrow's class. By next Monday, April 13, you must complete the Mineral Scavenger Hunt. You should use the sites below to help you complete this assignment. These sites will help you complete the assignment quickly and efficiently. If you choose to go out and just search on your own, this assignment will take an ETERNITY! So, use the sites provided. There are several ways to complete this assignment. You could . . .
Open up the assignment and write the answers on a sheet of lined paper. 1. Sedimentary Rock Identification. This activity was a bit hard today because we didn't know all the vocabulary. We are going to take care of this issue tomorrow during science class. NOTE: You will begin working on rocks this coming Monday. 1. Finish analyzing mineral samples and taking notes. Concentrate on the minerals below. 2. 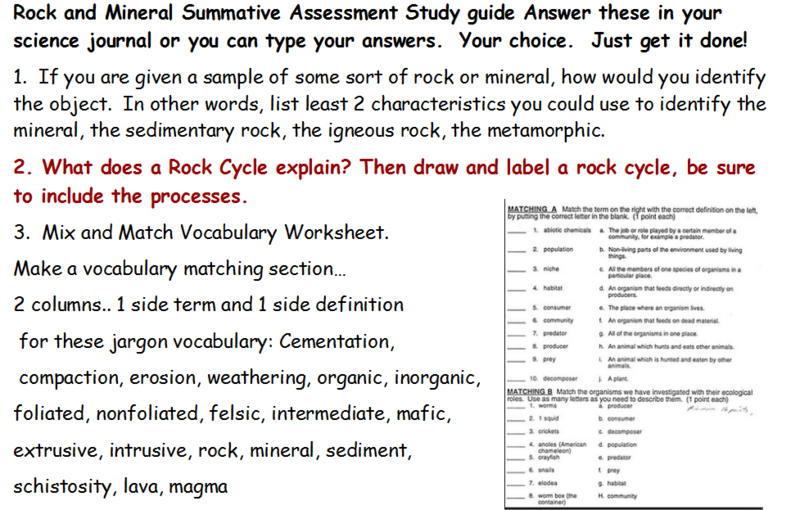 HOMEWORK: Study for tomorrow's mineral quiz. 1. Continue examining mineral selections. 1. Invite Mr. Scholz's class to join ours for the mineral lesson. 2. Go over yesterday's homework assignment. Make any and all changes to answers. a. In small groups, fill in the data table on at least one mineral. 1. Earth's magnetic field. You were to have answered six questions. I will collect them now or by 2:30 p.m. today! If you took a picture, you need to email me your picture at lori.young@evsck12.com. 2. Pretest. Take the pretest on My Big Campus. There are 10-questions. c. If you can scratch a mineral with your fingernail, it has a hardness of what? e. Are vitamins and minerals that are in your food the same thing? 2. Glaciation Reading. Open the google doc and MAKE A COPY of it before reading the passage on glaciers. After you read the passage, answer the questions that follow. GRRRR . . . I do NOT appreciate that several of you erased the google doc. Not nice! As a result of you erasing and changing the document, I have posted the article as a pdf file below. 3. HOMEWORK: None, unless you do not finish the glaciation reading. 1. Review using fault models to prepare for tomorrow's quiz. 2. HOMEWORK: Review for tomorrow's quiz. The quiz is on Faults, Boundaries, and Layers of the Earth. 1. Collect Reaction Activity AFTER we go over the assignment. 1. Complete activity given to you by my substitute. I will collect this from you tomorrow at the start of class. 2. I will give you 15-minutes to finish Friday's Fault Activity. 3. HOMEWORK: NONE . . . unless you did not finish the activity in science class. 2. HOMEWORK: NONE. I will give you 15-minutes to complete this assignment on Monday, but only 15-minutes. 2. HOMEWORK: Achieve 3000 Article: To Warn the People. This article is due tomorrow at the START of school, which is 7:30 a.m. (CDT). 1. Finish going over answers to worksheet. 2. HOMEWORK: ACHIEVE 3000 Article: To Warn the People. Make sure you have this article submitted to me by 7:30 a.m. Friday morning. 2. Discuss the answers to Monday's questions. 3. HOMEWORK: Achieve 3000 Article: To Warn the People. This article is found on your My Big Campus account. You will be given a ONE DAY extension because I forgot to post it yesterday. Sorry. So, the article must be completed by Friday, March 13 at 7:30 a.m.
1. Complete Earth's Layers and Plate Tectonic Questions. You completed half of this assignment on Tuesday, March 3 before the snow days. 2. These questions MUST be done for tomorrow's class. You will NOT have time to work on them in class. So, complete them tonight. 3. HOMEWORK: Achieve 3000 Article: To Warn the People. This article will be found on your My Big Campus account at 2:30 p.m. today. You must have this article completed by Thursday, March 12 at 7:30 a.m.
1. Review vocabulary from Friday's class. 2. Begin working in table groups to complete the activity on page 668. You will work on this today and tomorrow during class. 1. Finish the activity on page 668. Remember, you are working as a group. This will be collected tomorrow at the start of class. 2. HOMEWORK: Finish coloring diagrams on page 668. 1. Turn in activity on page 668. 2. WORK DAY in class. 2. Kahoot! game over vocabulary from Chapter 22 Section 3. 1. Half-Life Lab is canceled due to many forgetting to bring in pennies. 2. Complete review guide worksheet using Google docs! You will need to MAKE A COPY of this document BEFORE typing in your answers. NOTE: The online book is posted below #3 for your convenience. 3. HOMEWORK: Complete review guide worksheet. Due at the start of class tomorrow! You will NOT receive time to work on it in class. Sorry. You MUST do this for homework! a. Highlight the topic sentence on page 1 and page 2.
c. Read and COMPLETE the procedure steps 1-4 by the end of class. We will exchange data tomorrow. 3. HOMEWORK: NONE. We will finish this activity tomorrow! Thursday, January ﻿22, 2015 ... Didn't get as much done due to group pictures for yearbook!﻿ . .
1. Take a three question online quiz on half-life. Students were allowed to use their half-life data and line graph to these questions. 2. Titanic Mini-Project - topics based on topic chosen. 3. HOMEWORK: Continue pinning on topic. Topics are oceanography expert, Titanic construction expert, iceberg expert, and wreckage expert. By tomorrow's class, you should have at least 5 pins. 1. Continue working on Titanic mini-project - by the time you end class today, you would have at least 10 pins about your topic. 2. HOMEWORK: By the start of tomorrow's class, you should have at least 15 pins on your topic. You will use this information on the class assignment tomorrow. 1. Bye the end of class, you should have completed your assigned expert questions. You will use the answers to these questions tomorrow during class time. 2. HOMEWORK: Complete the expert questions. These answers are due at the start of class tomorrow. No exceptions! 1. Work as expert collaborative groups to compare notes and answers from yesterday's worksheets and the pins made. 2. Work as expert collaborative groups to problem solve. b. Draw your clay boat in your notes. c. Label the buoyant force on your clay boat. d. Label the gravitational force on your clay boat. e. Discuss with your expert group's how this clay boat applies to the Titanic. 2. Finish sharing information from expert groups. 1. Continue working on Titanic mini-unit by completing questions 1-10 on the overall_titanic_questions.pdf worksheet. The worksheet is posted below the homework for today. 2. Half of the class will complete the hypothermia activity with Mrs. Hartig. The other half of class will go tomorrow. 3. HOMEWORK: You ONLY need to complete questions 1-10. You will finish 11-20 tomorrow! 1. Finish all 20-questions. You will go over these answers tomorrow with your Titanic groups. 2. Second have of class will complete the hypothermia activity with Mrs. Hartig. We will go over these answers tomorrow at the start of class. 3. HOMEWORK; If you did not complete the 20 Titanic questions in class, you need to finish them tonight. You can find these 20-questions posted under Monday, February 2 assignments. 2. HOMEWORK: You have an OPEN notes test tomorrow over the Titanic. You may use your 20-questions/answers and your hypothermia sheet on this test. I'm posting a review guide for you. 1. Titanic Test. You should use your notes from science class. You can even use your notes for English and Social Studies. 3. HOMEWORK: Read pages 586 (1) - 594 (9) in the_rock_record_chapter.pdf. It is below. 4. HOMEWORK: Define and WRITE down the page number you found the definition on of these words: geologic time scale, eon, Precambrian, era, period, epoch, mass extinction. 1. Review and grade vocabulary from yesterday. 2. Discussion questions based off last night's reading. b. What is the significance of extinction events to geologists? c. Why do scientists know so little about the Precambrian Era? 3. Video Clip . . . we buffered and buffered and buffered. No such luck. 2. Worksheet on Geologic Time Scale. You are going to use the answers to this worksheet tomorrow for the Geologic Time Scale activity. 3. HOMEWORK: Complete the Geologic Time Scale worksheet. Make sure you remember to add 2 more examples! 2. Begin work on geologic time scale activity. The google docs link is below. You should be able to access it with your EVSC google account. 1. Finish working on the geologic time scale activity. You will use this time scale on an activity tomorrow. 1. Sit with your group from yesterday. 2. Exchange and evaluate another group's geologlic time scale project. 3. Complete a partner critique. 4. Pick up two papers on geologic time scale. You will complete these two sheets on Monday. 2. HOMEWORK: NONE . . . see you tomorrow? 2. HOMEWORK: None that I can think of except to stay warm. 2. HOMEWORK: Have fun, stay warm, take a nap, make a healthy snack, be nice to your loved ones, stay out of trouble. Perhaps I will see you tomorrow. 2. Begin work on Geologic Time Scale worksheet. This worksheet was handed out last Friday. 1. Finish working on Geologic Time Scale Worksheet. If you need another copy of it, you can download the Excel handout below. 2. HOMEWORK: Finish any and all remaining worksheet items. 1. Use Geologic Time Scale Worksheet to complete analysis/conclusion questions. 2. Turn in above assignment by the END of today's class. 3. Achieve 3000: A Mammoth Find. Pull up My Big Campus and complete this article by Friday, February 27 at 8:56 A.M. (CDT). You will find this article under school work. 4. HOMEWORK: Complete Achieve 3000 article by Friday, February 27, 8:56 A.M. (CDT). 3. HOMEWORK: Finish coloring diagram. We will assemble the diagram tomorrow if necessary. 1. Take notes on Earth's Layers. You are responsible for finding the following information: Thickness of each layer, temperatures of each layer, chemical makeup of each layer (Example: Inner core is made of iron (Fe)), and density of each layer. Here is a good ﻿site﻿ for finding density. 3. HOMEWORK: Your achieve article is due TOMORROW! 2. READING. Your job is to open the reading selection and to read through Chapter 1, Section 1. As you read these pages, you will notice 3 reading checkpoints. You need to record your answer to these three reading checkpoints in your science journal. 1. Go over reading checkpoints. 2. Complete the following Google document.